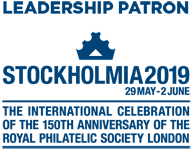 On May 19th, 2011 David Feldman sold a 1948 10 Rupee Mahatma Gandhi stamp of India for a World Record price of EUR 144,000 (US$ 205,000); this is the highest price ever paid for a single Indian stamp (smashing the previous 2010 record set by the 4 Annas “Inverted Head” error). Additionally it is also believed that this sale possibly represents a World Record price paid for a modern issued stamp from any country. The stamp, probably the finest remaining example out of only 18 known in existence today, was issued by the Government of India as a set of 4 commemorative stamps on August 15th, 1948 as a tribute to the father of the nation Mahatma Gandhi, who was assassinated in January of the same year . These were the first commemorative stamps of Independent India, and issued in 4 denominations – 1 ½ / 3 ½ / 12 Annas, and the 10 Rupees. A set of only 100 10 Rs. stamps (in two sheets) were overprinted with “Service”, making these the world’s least printed stamp. In the same auction session, part of a fabulous Grand Prix winning collection of covers of Indian stamps used in Burma, attracted interest from all over the World. During a tense period of bidding, the collection was sold for a total amount of EUR 672,000 (US$ 957,000). 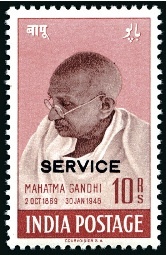 India Gandhi optd Service stamp sold for a record price. A record. But the contribution of the Man on stamp is invaluable to the mankind, difficult to estimate in terms of money. But did the realisation really surpassed the price of the recently sold Head Inverted? It said to be sold for a princely sum of Euro 167 000!!!!!! An inverted head was recently hammered down for €140’000 plus 19% commission, but there is some doubt as to whether the bidding reached the reserve. Either way, the India market is so hot at the minute, that it may not be long before the record is broken again! i wanted to know the price of other 3 stamps that had been issued in 1948, 1.5 annas , 3.5 annas and 12 annas .